Unsurprising as the turnaround may be, some of the arguments made by Tharoor in the article have far-reaching implications and merit attention. Shashi Tharoor, in an article published in The Print on 10th November, has made some arguments against the appropriateness of the Supreme Court verdict on Sabarimala. In making his case, he criticises the firm position of the Left-led state government on the issue and calls it misplaced. It may be recalled that on 3rd October, the prominent Congress leader had welcomed the judgment and said that “every time a historic change came, there were a lot of traditionalists who resisted”. This about-turn is in line with the shifting positions of the Congress party which is currently organising padyatras across Kerala against the verdict. Unsurprising as the turnaround may be, some of the arguments made by Tharoor in the article have far-reaching implications and merit attention. He makes two basic claims. First, he argues that on the question of Sabarimala, there is a basic conflict between liberal values like equality, on the one hand, and freedom of religion, on the other. While the former belongs to the domain of reason and constitutional principle, the latter pertains to matters of faith which are beyond reason. In situations of tension between the two, secular democracy demands a political “negotiation”. It is clear from the article that in the case of Sabarimala, by “negotiation”, Tharoor simply means a capitulation to the demands of the protestors. Second, he claims that underneath the current turmoil is a conflict between liberalism and democracy. While the Supreme Court has followed liberal precepts in delivering its verdict, democratic will, which Tharoor finds manifested in “informal surveys” and such like, pulls in the other direction. He argues that as a democratically elected representative of the people he is obliged to prioritise the latter. Both the arguments advanced by Tharoor are misplaced for the following reasons. First, the wall he erects between equality and freedom of religion is without historical foundation. Freedom of religion or conscience, as a right, emerged as a part of the Enlightenment, a process of thoroughgoing social change in Europe from the 16th to the 18th century. The defining features of this process were a separation between ecclesiastical authority and state power, an overall curtailment of the hold of religion over public life, a fundamental retreat of aristocratic and monarchical authority, and the establishment of modern democracy based on the idea of equal citizenship. These features were different aspects of an overall process of democratisation, and were therefore interlinked. Decreasing religious sway over social and political life went hand in hand with increasing public criticism of religious institutions and dogma. Freedom of expression and conscience took root as a part of this process of subjecting religion to public scrutiny. Of course, criticism of religious authority also meant criticism of aristocratic inequality and hierarchy since the former provided ideological justification for the latter. Individual freedom of conscience and the modern ideal of equality, therefore, have historically been fundamentally interrelated. By driving a radical wedge between the two, Tharoor denies this history. Second, even in legal and constitutional terms, there is no fundamental strain between equality and freedom of religion. Tharoor says that in the judgment delivered on September 28, the Supreme Court chose Article 14 over Article 25. This is a blatant untruth. Four out of the five judges in the Sabarimala case explicitly held the bar on women’s entry to be violative of Article 25 since it denied women their right to freedom of religion. By ruling in such a manner, the judges not only denied any contradiction between equality and Article 25, but in fact affirmed the centrality of the Article to the constitutional spirit of equality and individual dignity. Even Article 26, which deals with the rights of religious denominations, is subject to the demands of equality. In cases like Sri Venkataramana Devaru and Others v. State of Mysore and Others, the Supreme Court has quite consistently held that Article 26 cannot be used as a device to deny fundamental rights. A number of these cases dealt with the entry of Dalits into temples. By completely ignoring such established constitutional principles, and by misrepresenting the Sabarimala judgment, Tharoor attempts to illegitimately separate freedom of religion from the overall constitutional framework. Freedom of religion is an integral component of, rather than an exception to, the transformative constitutional project. Finally, there is no contradiction between the liberal demand of equality and democratic representation. As stated earlier, the modern democratic ideal emerged from a protracted struggle against aristocratic, monarchical and ecclesiastical power. The notion of inherent equality, as manifested most famously in the Declaration of the Rights of Man and of the Citizen, has been at the foundation of this ideal. In fact, the slogan of equality has animated the demand for democratic rights throughout the modern period. The struggles of the working class, women, and oppressed races for voting rights continued well into the twentieth century and were obviously based on equality as a governing ideal. In the Indian context, the adoption of the principle of one-person-one-vote was a significant advance in a deeply unequal society and reflected the egalitarian aspirations of the vast masses of the exploited and the oppressed. It is no coincidence that the very constitution which grants universal suffrage also outlaws untouchability. By invoking democratic representation in defence of an exclusionary religious practice, therefore, Tharoor directly obfuscates the link between democracy and equality. Despite his “instinctive liberalness” and much-flaunted erudition, Shashi Tharoor’s article places him in unsavoury company. 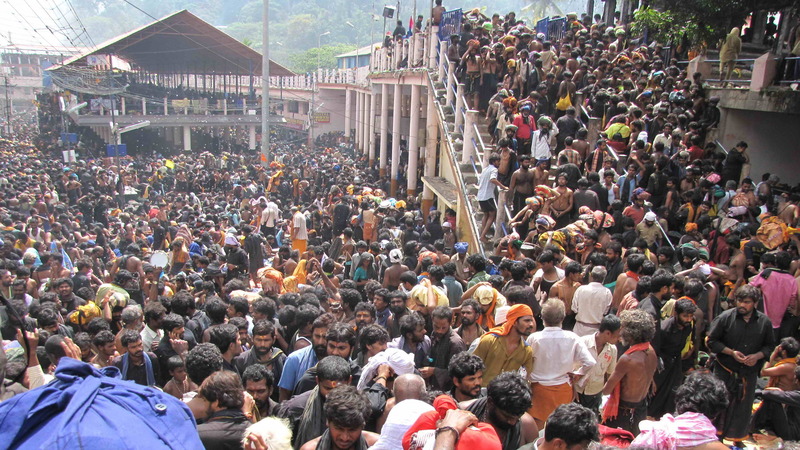 In defending the entry ban at Sabarimala by ignoring essential aspects of our social and political history, distorting the basic nature of our constitutional framework, and misrepresenting the Supreme Court verdict, Tharoor has willy-nilly joined the ranks of the menacing thugs physically preventing women from entering the shrine. Is this an aberration – an error of judgment from an otherwise progressive politician? Or is it an indication of the Congress increasingly becoming a mirror image of the RSS in its bid to counter the latter? The recently released Congress manifesto for the Madhya Pradesh elections, with its promises of a gaushala in every village Panchayat and commercial gaumutra production, suggests interesting answers.